In the UK, we currently have an organic action plan in place in Scotland and one is under development in England. However, many other European regions are developing their own, including some as part of an Interreg Europe funded project SME Organics. The focus is on helping food businesses develop products and the market for organic food. Nic Lampkin has been advising the eight regions on behalf of the IFOAM EU Group and reports on progress to date. While EU policies, in particular conversion and maintenance support, have played an important part in the development of the EU organic sector, regional authorities have huge potential to prioritise other forms of support for organic approaches, such as market development. The EU’s 2014 Action Plan for Organic Food and Farming encourages regions to find the most adequate policy and funding mix to support the development of the regional organic sectors. SME Organics brings together regional governments, development agencies, organic food and farming groups, enterprise bodies, universities and research institutes from eight regions across Europe over a 4-year period 2016-2020. The regions are Lombardy and Apulia in Italy, Nouvelle Aquitaine in France, Navarra in Spain, Northwest Romania, Aargau in Switzerland, South Ostrobothnia in Finland and Lodzkie Region in Poland. The overall objective of SME-Organics is to improve policies and programmes under the Investment for Growth and Jobs goal in order to enhance the competitiveness and sustainability of small and medium-sized enterprises (SMEs) in the organic sector. The aim is to support SMEs and enhance the growth capacity of the entire organic regional sector in regional, national and international markets. As part of a participatory learning process, partners and stakeholders exchange and share experiences of best practices for devising Organic Action Plans. The development of these action plans covers a number of areas such as production and processing, commercialisation and marketing, training and advice, and organic value chain efficiency and governance. The main outputs of the project include: a Method Guide, Diagnosis reports of the regional organic sectors, a Good Practice Guide, a Policy Road Map, Regional Policy Briefs and Regional Action Plans, with recommendations for integration into RIS3. Stakeholders benefiting from the project include all actors in the organic value chains at the regional, national and EU level: cooperatives, agri-food industries, retailers and distributors of organic products, advisory services, chambers of commerce and agriculture, experts on regulatory issues of the organic sector, policy makers, EU’s DGs and other initiatives in the organic sector. The first phase from 2016 to March 2018, focused on the development of organic action plans in the eight regions, which were presented at a meeting in Brussels on 23rd March. The meeting also provided the opportunity to launch the new method guide or manual on Organic Action Plans: Development, Implementation and Evaluation. 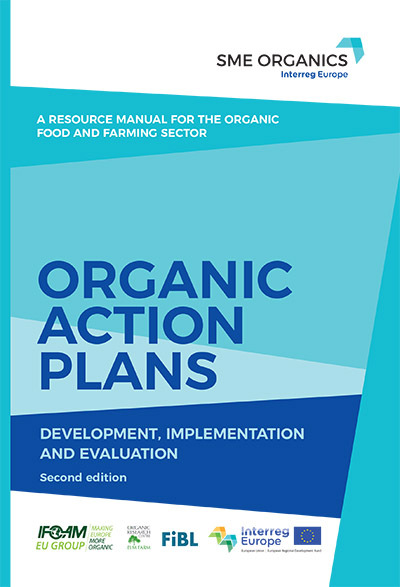 Edited by Stephen Meredith (IFOAM EU), Nic Lampkin (ORC) and Otto Schmid (FIBL), with research input from Max Hubbard (ORC), the manual provides a guide to the key issues that need to be considered during the different stages of the organic action plan process. The manual builds on a first edition published ten years ago as part of the Organic Action Plan project, which also saw the development of a toolbox for the evaluation of organic action plans. The next phase of the SME Organic project will see the eight action plans implemented over the next two years, with a monitoring programme in place to record their achievements.